Gilead Pharmaceuticals has been the subject of many posts in this blog because it is a very good Dividend Machine stock. The best Dividend Machine stocks deliver dividends, dividend increases, and provide covered call opportunities. Conservative income investors will make sure the underlying stock like GILD has solid fundamentals as well as a history of dividend increases. Listed below are three calls I sold on some of the GILD in one of the retirement portfolio accounts I manage. You have all read about selling calls in a retirement portfolio. The strategy is considered a safe one. Even the series 7 exam (required to be a stock broker) has many questions on this strategy. If you are about to take that test and the question asks if covered calls are appropriate for retirees, the answer is yes. Laddering calls, like laddering bonds, means you spread out the expiration dates and the strike prices. This way you can work the upside potential at the same time as working for income. Covered calls do limit upside potential. When you have a growth stock with call option opportunity, you can often times get very large premiums. Yet, those very stocks can soar and you feel like an idiot missing out on the opportunity. But we are income investors and just take those gains and plow them into another stock, preferably one with a solid dividend. Laddering the expiration dates and strike prices can help capture some of the upside potential. I still like to make sure the lowered strike price generates an 8 to 10% capital gain should my shares be called away. Covered calls also do nothing to protect you from down side risk. You would have to buy a put option for protection. I very rarely buy puts to protect a position and almost never on an income stock. I would rather just get rid of a loser and not pay anyone to do that. You see, when you sell calls on your shares, you cannot sell your shares should the stock price crater and therefore, you are stuck with the holding until the call expires. Therefore, for very conservative income investors who like me have to make 5% or more selling calls on good dividend stock is the safer of all the moves. Dividend Machines can soar at times and act like growth stocks. A beta of 1 indicates that the security's price moves with the market. A beta of less than 1 means that the security is theoretically less volatile than the market. A beta of greater than 1 indicates that the security's price is theoretically more volatile than the market. For example, if a stock's beta is 1.2, it's theoretically 20% more volatile than the market. Conversely, if an ETF's beta is 0.65, it is theoretically 35% less volatile than the market. Therefore, the fund's excess return is expected to underperform the benchmark by 35% in up markets and outperform by 35% during down markets. Select a stock with good fundamentals. Gilead is in between it's 52 week high of $89.54 and low of $64.27. Today it is trading at $76.67. My average basis is $73.98. GILD pays a quarterly dividend of $.57 for an annual yield of 2.97%. Their most recent dividend increase, two quarters ago, was 9.6%. Average dividend increase over the past three years has been 10.85%. Folks this is a lovely income machine. Just on these actions, I get the 3% dividend and a total of 4.31% call premiums. Now I can rest for the day. Each of these calls has an expiration date that provided for capture of the dividend as well as the call premium. I won't like losing GILD if it soars but I am not committing all my shares to the calls. 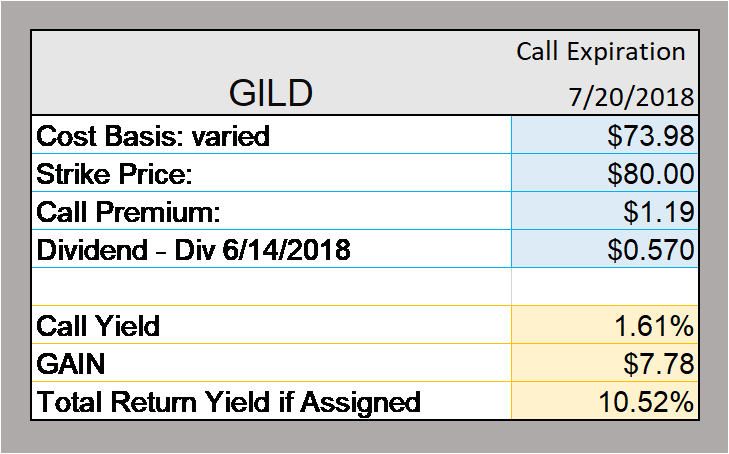 I am simply using these laddered calls to render GILD a 5% producer at a minimum.